Cut each spaghetti squash in half lengthwise. Scoop out and discard the seeds. 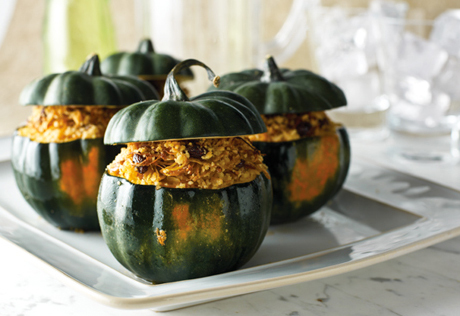 Sprinkle the inside cavity of each squash with black pepper and place them cut-side down in a 17 x 11-inch roasting pan. Bake for 45 minutes or until the squash is fork-tender. Scrape the squash with a fork to separate the spaghetti-like strands and place the strands in a large bowl. Stir in the pecans, raisins, brown sugar and pumpkin pie spice. Cut off the “tops” of the acorn squash, about 1 inch from the stem end and reserve. Scoop out the seeds and discard. Cut a small portion off the bottom of each squash to make a flat base. Place the squash shells in the roasting pan. Spoon the spaghetti squash mixture evenly into the cavities of each acorn squash. Stir the cracker crumbs and butter in a small bowl with a fork. Sprinkle the crumbs evenly over the squash mixture. Bake for 45 minutes or until the mixture is heated through. Place the reserved squash tops on a baking sheet and bake for the last 5 minutes of baking time. Top each squash with an acorn top.